Objectives: The aim of this study was to determine the dentist's knowledge and practice about dose reduction techniques, radiographic equipment and quality of dental radiographic service among private dental practitioners in Davangere City, India. Materials and Methods: The survey was performed on 80 dental practitioners from Davangere City, India. Information on the demographic characteristics of the dentists, radiographic equipment, techniques and processing they used and radiation protection was obtained with a 40 point questionnaire. Results: The study yielded a response rate of 90%. The respondents' knowledge concerning the technical details of their equipment was limited, with 27.7% not knowing kVp settings of their equipment. 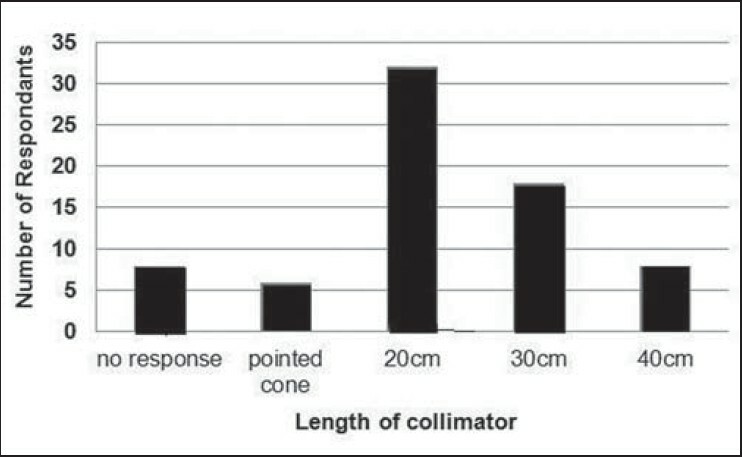 Only 11% and 5% respondents reported having long and rectangular collimators respectively. Regarding the film speed 16.6% dental practitioners were unaware about it. The most preferred technique (81%) for periapical radiography was the bisecting angle technique. Lead aprons were worn more often by female dentists. None of the dental practitioners had thyroid collars. The distance of the dentist to the radiation tube during exposure was on average 2.2 m, although 13% of the dentists assisted in holding the image receptor inside the patient's mouth. Only 4% of the dental practitioners reported that they used automatic processor. About 40% of the dental practitioners used film badges. Conclusions: In the present study, the results indicate that for minimizing any unnecessary radiation, attempts should be made to improve dentists' knowledge about radiation dose reduction techniques. Some dose-reducing strategies are commonly used in Davangere Dental clinics, whereas others have not gained wide acceptance. The aim of the present survey was to determine to what extent dentists in Davangere comply with commonly accepted measures to reduce radiation dose to patients as well for the operators. A written questionnaire was distributed by visiting each dental clinic among 80 private dental practitioners. Dentists were assured about the anonymous processing of the questionnaire, explaining the purpose of the research. A second follow-up was carried out to collect the completed questionnaire. The resulting data was coded and statistical analysis was evaluated using SPSS (Statistical package for social sciences) software Version 17.0; Chicago, IL, USA. Mean was calculated for demographic variables and percentages were calculated for the responses given by dentists. Data was evaluated according to the frequency distribution and the significance of differences between two independent groups was determined using the Chi-squared test. The study yielded a response rate of 90%. Among the 72 respondents, 61 were male and 11 were female dentists. 50% of the respondents were below 35 years and 50% were above 35 years of age. Of the 72 respondents, 57% identified themselves as non-specialist and 43% as specialist. Only 57% dentists reported that their X-ray units had been serviced routinely. The respondents' knowledge concerning the technical details of their equipment was limited, with (33%, 27.7% and 45%) not knowing the tube current, tube voltage and the amount of filtration of their machine respectively). As well, it was worrying that 18.5% of the dental practitioners did use their equipment set at <65 kVp. 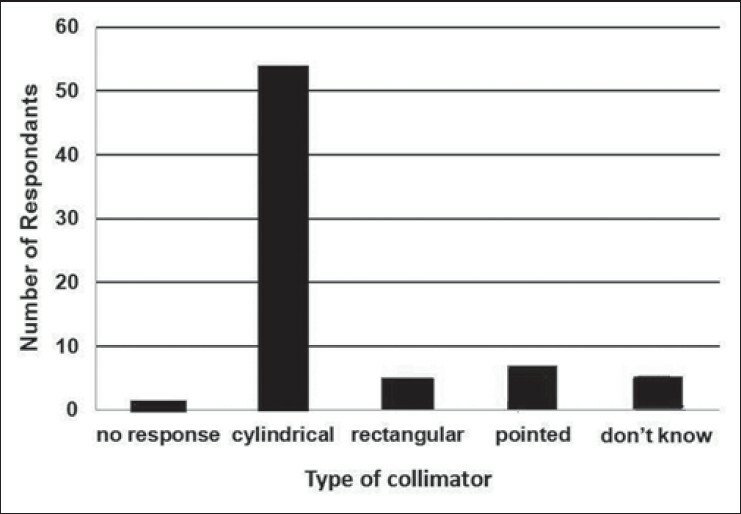 Only 5% of the dental practitioners [Figure 1] used the rectangular radiation tube or rectangular collimator for a round radiation tube, whereas 11% used the long cone [Figure 2]. Long cone was the most preferred cone type among younger dentists (16.6%). A statistically significant difference was found between the cone type and age (P = 0.042 S). Among the observed general practitioners and specialists, the specialists preferred the long cone, which was statistically highly significant (P = 0.000 HS). Nearly 86% of the practitioners preferred the conventional radiographs in which, most of them used higher speed classes (E speed: 74% or F speed: 2%), with only 4% of the respondents still using the slow D-speed film and 16% did not know the speed of the film they used [Figure 3]. Only 14% dentists replied that they had digital radiography. On an average, every dental practitioner exposed 20-40 intraoral radiographs every month. The majority of the dental practitioners (55%) reported using film holders. But, most of the time, 32% of the dental practitioners asked their patients to hold the films inside the mouth with their fingers for almost every exposure. A surprising finding was that 13% of the dentists held the film themselves while the radiograph was being taken of the patient. Several combinations of radiographic views were considered for the initial visit of the patient and the periapical views of a limited area were used by 87.5% of the dental practitioners. 69.5% of the dentists reported that they took the radiographs themselves, whereas 29.5% had this procedure done by an X-ray technician. The most preferred technique (80.5%) for periapical radiography was the bisecting angle technique among the dentists and 40% of them used the technique for diagnosis of dental caries. Almost 70.8% of the dental practitioners did not have the lead aprons. 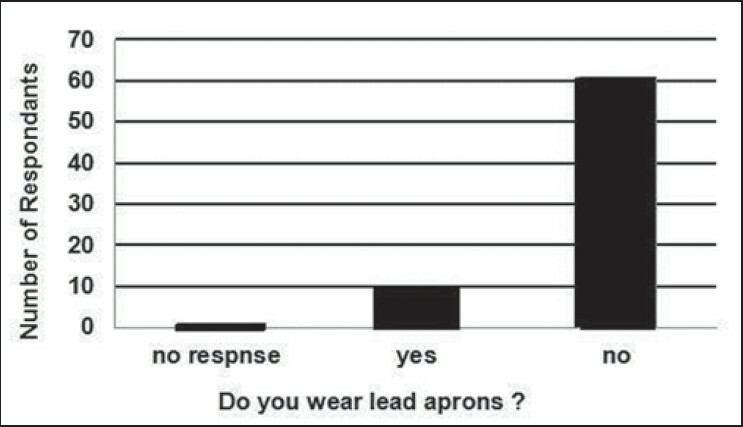 Surprisingly 84.7% of the practitioners, who had the lead aprons, did not wear the aprons [Figure 4]. 61% of the dental practitioners did not use lead apron for patient protection. Whereas, a majority (54.5%) of female dentists worn lead apron. This relationship between gender and lead apron wearers was found highly statistically significant (P = 0.000 h). 61% of the dental practitioners took radiographs for pregnant woman without any protection. 50% of the dental practitioners were not aware about the thyroid gland being the most sensitive organ to dental radiography. The relation among the age group was statistically significant (P = 0.011 S) wherein, dentists aged >36 years were aware of the fact that thyroid gland is the most sensitive organ to dental radiography. As well, none had the thyroid shield for the thyroid protection in their clinic. The aforementioned 13% of the dental practitioners, holding the film into the patient's mouth, always stood next to the patient during the radiographic exposures. Despite 19.4% of the dental practitioners had lead barrier in their clinic, 60% followed distance rule position with 48% standing at a distance of 6 feet. There was a significant relationship between gender and distance, with the male practitioners more often standing at a 6 feet distance (P = 0.050). Only 4% of the dental practitioners reported that they used automatic processor, 92% manual processing and 2.7% self-processing films. 58% of the dental practitioners did not check the temperature of processing solutions. 36% of the dental practitioners changed the processing solutions in 2 weeks and 24% changed in 30 days. Finally 32% dentists reported that they used view box when looking at their films, whereas 65% used a special X-ray viewing light attached to the dental chair. Nearly 40% of the dental practitioners used systems such as film badges for monitoring radiation exposure to personnel. The results of this survey, which highlights the lack of knowledge regarding various aspects of dental radiography and radiation protection amongst the dental practitioners, needs to be considered in the overall context of the country. Dentists should continuously evaluate the quality of the images produced in their ofﬁces to ensure that they are optimally exposed. To ensure the optimum exposure conditions, quality assurance of the radiographic system should be performed. One of the basic steps of quality assurance is X-ray machine maintenance, and regular check-ups of the equipment are a necessity. , In our study, 43% of the dental practitioners performed regular check-ups of their X-ray machines. The results of the Jacobs et al. study are consistent with the present study. Filtration using aluminum is an established component of dental X-ray equipment. Practically, 1.5 mm Al total filtration for X-ray equipment operating at 60-70 kVp and with 2.5 mm Al total filtration when operating above 70 kVp is advised which is followed by most of the manufacturers. In this study, 45% dental practitioners did not know about the tube filtration of their equipment. For intraoral radiography, E-speed or F-speed film should be used rather than D-speed film to reduce the patient exposure. Our study showed that E-speed radiographic film is used exclusively by 75% of Dentists and D-speed film by 2%. This has been in good agreement with the data presented by Kaviani et al. who reported about 70% use of E-Speed intraoral films in private dental clinics. 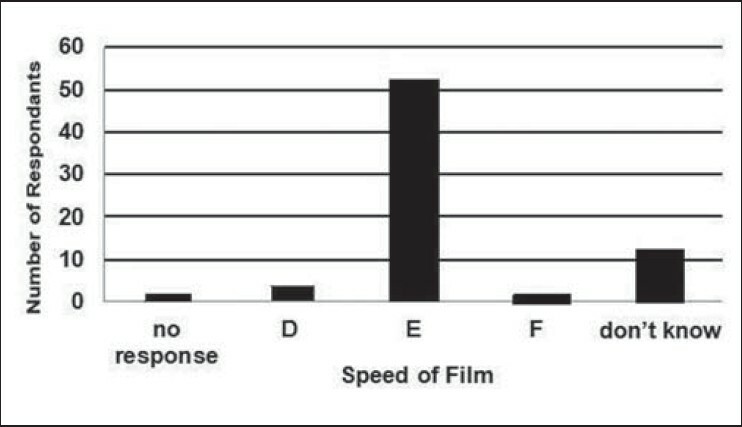 In the present study, 16% of the dental practitioners were not aware of the speed of films. In the study carried out by Ilgüy et al.,  65.8% of dental practitioners were not aware of film speed. The most sensitive intra-oral film generally used in dental practice is E-speed which results in a dose reduction of 40-50%, when compared with D-speed film. Among the respondents of this study, only 2% of the dental practitioners used F Speed. Dentists should be encouraged to shift from D and E speed films to the faster F-speed film to reduce 20% radiation dose to their patients. The dentist should view radiographs under appropriate conditions for analysis and diagnosis. Radiographs are best viewed in a semi darkened room with light transmitted through the films, and all extraneous light should be eliminated. In our study, 65% used a special X-ray viewing light attached to the dental chair and 32% of them used a viewing light box placed beside the dental chair. Consistent results were obtained in Ilgüy et al. study wherein 64.7% dentists reported that they used view box to interpret radiograph. The results indicate that for minimizing any unnecessary radiation, attempts should be made to improve dentists' knowledge about radiation dose reduction techniques. One of the limitations of an investigation of this nature is the possibility of bias. It is possible that some answers may represent the ideal situations intended by the respondents, but adherence to these standards may be lax in other times or areas of practice. Thus, variation in standards may occur within dental clinics that are not reflected in our results. Continuing educational programs can help to improve the radiation safety for dental patients as well for the operators. 1. Okano T, Sur J. Radiation dose and protection in dentistry. Jpn Dent Sci Rev 2010;46:112-21. 2. Shahab S, Kavosi A, Nazarinia H, Mehralizadeh S, Mohammadpour M, Emami M. Compliance of Iranian dentists with safety standards of oral radiology. Dentomaxillofac Radiol 2012;41:159-64. 3. Horner K. Review article: Radiation protection in dental radiology. Br J Radiol 1994;67:1041-9. 4. Jacobs R, Vanderstappen M, Bogaerts R, Gijbels F. Attitude of the Belgian dentist population towards radiation protection. Dentomaxillofac Radiol 2004;33:334-9. 5. Syriopoulos K, Velders XL, van der Stelt PF, van Ginkel FC, Tsiklakis K. Mail survey of dental radiographic techniques and radiation doses in Greece. Dentomaxillofac Radiol 1998;27:321-8. 6. Salti L, Whaites EJ. Survey of dental radiographic services in private dental clinics in Damascus, Syria. Dentomaxillofac Radiol 2002;31:100-5. 7. Eskandarlou A, Sani KG, Rostampour N. Observance of radiation protection principles in Iranian dental schools. J Res Med Sci 2010;15:292-3. 8. Ilgüy D, Ilgüy M, Dinçer S, Bayirli G. Survey of dental radiological practice in Turkey. Dentomaxillofac Radiol 2005;34:222-7. 9. Bohay RN, Kogon SL, Stephens RG. A survey of radiographic techniques and equipment used by a sample of general dental practitioners. Oral Surg Oral Med Oral Pathol 1994;78:806-10. 10. Gibbs SJ, Pujol A Jr, Chen TS, James A Jr. Patient risk from intraoral dental radiography. Dentomaxillofac Radiol 1988;17:15-23. 11. Kaviani F, Esmaeili F, Balayi E, Pourfattollah N. Evaluation of X-ray protection methods used in dental offices in Tabriz in 2005-2006. J Dent Res Dent Clin Dent Prospects 2007;1:49-52. 12. Mutyabule TK, Whaites EJ. Survey of radiography and radiation protection in general dental practice in Uganda. Dentomaxillofac Radiol 2002;31:164-9. 13. Alcaraz M, Navarro C, Vicente V, Canteras M. Dose reduction of intraoral dental radiography in Spain. Dentomaxillofac Radiol 2006;35:295-8. 14. Rohlin M, White SC. Comparative means of dose reduction in dental radiography. Curr Opin Dent 1992;2:1-9. 15. White SC, Pharoah MJ. Radiation safety and protection. In: Oral Radiology: Principles and Interpretation. 6 th ed. China: Mosby Elsevier; 2004. p. 25-46.